EL ALTO, Bolivia (Reuters) – In El Alto, a former shantytown high in the Andes that has mushroomed into Bolivia’s second-largest city, students and professors are growing disenchanted with Evo Morales, the leftist president their protests helped put in power a decade ago. A sprawling settlement of nearly 1 million people on Bolivia’s dusty Altiplano plateau, El Alto is a larger and more politically radical extension of the capital La Paz, which sits hundreds of meters below in a canyon. An uprising here in 2003 over the use of revenues from the poor South American nation’s natural gas reserves helped force the resignation of U.S.-backed President Gonzalo Sanchez de Lozada. Some 60 residents were killed in the upheaval. The protests were led in part from the campus of El Alto’s public university UPEA and opened the way for Morales to take power as Bolivia’s first indigenous president three years later. Now, students and teachers feel forgotten. Demonstrations, some violent, have broken out in recent weeks over what teachers and students call insufficient funding for the school, a potential obstacle in Morales’ plan to win a fourth term in 2019. Morales fulfilled protesters’ demands to nationalize the gas industry after taking office in 2006, promising to spread natural resource wealth in the country of more than 10 million, long one of Latin America’s poorest. Bolivia’s economy grew and thousands of Aymara peasants moved to El Alto. While El Alto generally remains poor, some immigrants became wealthy merchants, building glamorous, colorful homes known as “cholets” and hosting lavish parties. Lines of cable cars, inaugurated by Morales, whisk Bolivians between El Alto and La Paz, above the dizzying mountain traffic. Yet Limachi said the public university, which charges students next to nothing, has been unable to pay its teachers for three months. Morales’ administration, one of Latin America’s few remaining hard-line leftist governments after the region turned to the right in recent years, says it increased spending on education by 25 percent since 2006. It questions UPEA’s use of its funding and the number of students enrolled. Due to its history, the recent protests at UPEA have drawn national attention, especially as they coincided with a widely criticized court decision in late November allowing Morales to run for a fourth turn. Bolivia’s constitutional court, padded with members of Morales MAS party, argued term limits violate human rights – defying the result of a referendum last year in which 51 percent of Bolivians said they opposed Morales running again. The ruling was criticized by the United States and raised eyebrows in urban areas across Bolivia where support for Morales is weakening. Mining communities, coca farmers and rural villages generally still support him. Across the sprawling city of El Alto, where new homes are being built every day, discontent had been creeping up for some time. Since 2015, the city has had an opposition mayor. “It’s quite disturbing that our demands are not being listened to,” said Celia Quecana, a UPEA sociology student dressed in a traditional Aymara pollera, a flowing skirt worn in the Andes. She said that Bolivia’s constitution guarantees funding for public universities. “There’s a lot of discontent that democracy, in the form of the Feb. 21 (2016) referendum, has not been respected,” she said at the university, where trash had not been collected nor bathrooms cleaned for days. In judicial elections on Dec. 3, nearly 54 percent of Bolivians spoiled their ballots rather than voting, as a means of protesting against Morales. “Vote null” graffiti remains scrawled across walls in El Alto and La Paz. 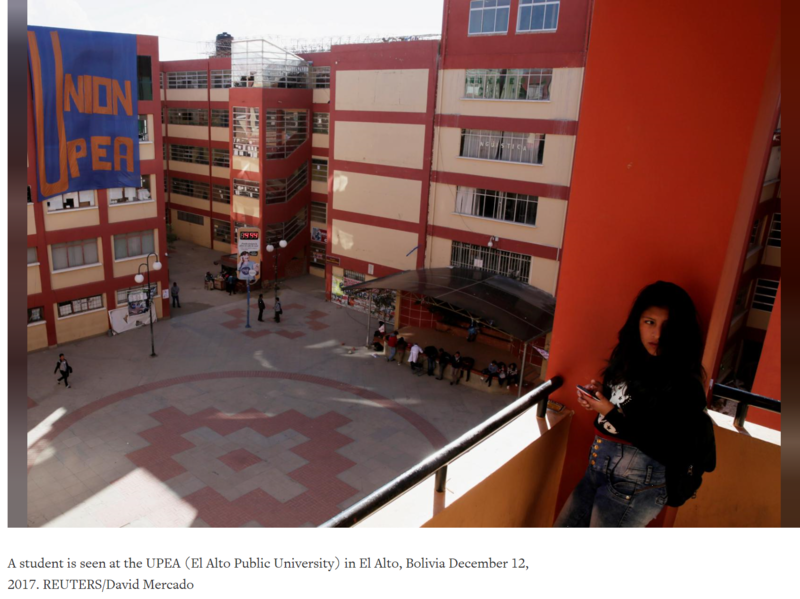 As El Alto has grown, so has the number of students studying at UPEA, the basis for the university’s dispute with the government. UPEA says it now has 47,000 students, double the 2011 enrollment when the amount of funding it receives was determined. For Diego von Vacano, a Bolivian political scientist at Yale University, the UPEA protests have legitimate roots and touch on a major problem for Morales. The United Nations says Bolivia spent about 7 percent of its gross domestic product on education in 2014, its most recent data, a percentage that is high for Latin America, although one that had not changed much over the past decade. El Alto’s explosive growth coincided with the end of a commodities boom felt in Bolivia through lower gas prices, which have halved since 2006. Bolivia’s gas production peaked at an average 59.6 million cubic meters per day in 2014 and has fallen for the past two years, according to the government. “The gas issue is incredibly important, it affects everything. We had received an impressive amount of money, but it’s gone down for everyone,” said Nelson Vila, a UPEA professor who was hospitalized after clashes with police in November. This entry was posted in Bolivia, Politics, Social Unrest and tagged demagogue, democracy in peril, government failures. Bookmark the permalink.